Does anyone have information as to the EXACT whereabouts of Tibet's pre-1950 Post Offices? When I visited Tibet in 1988 I only saw the Shigatse and Lhasa Post Offices - but they were modern Chinese buildings. I welcome any information - or maybe a member could Post photographs. 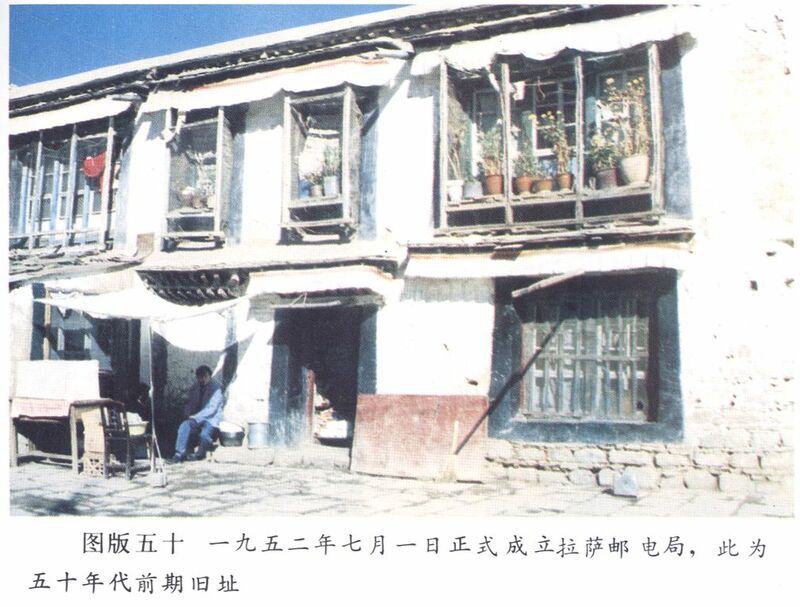 in an 1995 Tibet Handbook in Chinese Language i fond the shown images which apparently shows an post office in Tibet. Maybe some Chinese speaking members can translate the Chinese text below the pictures? I have never seen a street plan of Phari, but examination of pre-1950 captioned photographs of Phari ought to make identifying the building possible. Other books of the 1920-1950 period refer to the post in Tibet and I will try to put together a list of references. One problem is the lack of distinction between British Indian and Tibetan post offices, which were, I believe, not usually the same premises. Post and Telegraph Offices existed in Sovereign Tibet ( pre-1950) the first was Gyantse and the second Lhasa. Got to check David MacDonald's LAND OF THE LAMA for the exact date of establishment. P&T Dept. of the Govt. of India regulated P&T services in Tibet. It fell under Darjeeling Postal Division of British Bengal . This arrangement continued till 1954, years after the British left India (see Richardson's History of Tibet, 1962). My father a clerk with Darjeeling Divisional Office was threatend to be transferred to Gyantse P&T Office in 1949. A punishment of sorts for organising strike of the P&T Employees . My father use to tell a lot about Gyantse Post Office, Anecdotes he heard in Darjeeling . Unfortunatly no written record exists. I shall await further information. Bob, Thanks for response. I have the Spencer Chapman book. There are one or two photos of the Dak Bungalow at Phari in the Tibet Collection of Photographs (see Link on Geoffrey Flack's Tibet stamps site. Click on "Tibet", then Link below) but one cannot be sure where the Post Office is! Your reply intrigues me. I was in Darjeeling in March this year - what a pity we could not have met! I also visited Darjeeling Post Office - now a Heritage building! If your father was a clerk with the Divisional Office and had stories & anecdotes about Gyantse Post Office you must tell members what you know. Or maybe write an article for the Postal Himal magazine? could you already locate a Mandarin translator for the translation of the photo text? I have only just seen the request for translations of the captions to the two Tibetan post office photographs. Plate 18: Originally the Danjilin Temple [I don't have the Tibetan name for this to hand but I will try to check]. The Tibetan Local Government [ie the independent government] established the Jhokang Post Office here in 1912 and it operated until it was closed down in 1959. Plate 50: Lhasa Post Office, officially established 1 July 1952. This was the old site of the post office in the 1950s. thanks for the reply. I just wonder what City/Post Office Jhokang had been? Was it in Lhasa as there is a famous place/temple? But in that case it appears, based on the translation of the other photo, that there had been several Post Offices at Lhasa. On the basis of those two photographs it does look as if there were two post offices in Lhasa, at least between 1952 and 1959. The Jokhang is of course in Lhasa and so was the Danjilin Monastery. I am fairly sure that this is the Tengyeling Monastery that was demolished in 1912 because the monks had cooperated with the Chinese military. I will see what further information I can find on this. Indeed the photographs show the Lhasa Post Office after 1959. It was established towards 1912-13 in a remnant building of the destroyed Tengyeling (bstan rgyas gling)monastery. This monastery was destroyed,(and the monks expelled),as punishment because those monks had sided with the Qing Manchu troops during the 1909-1912 occupation. 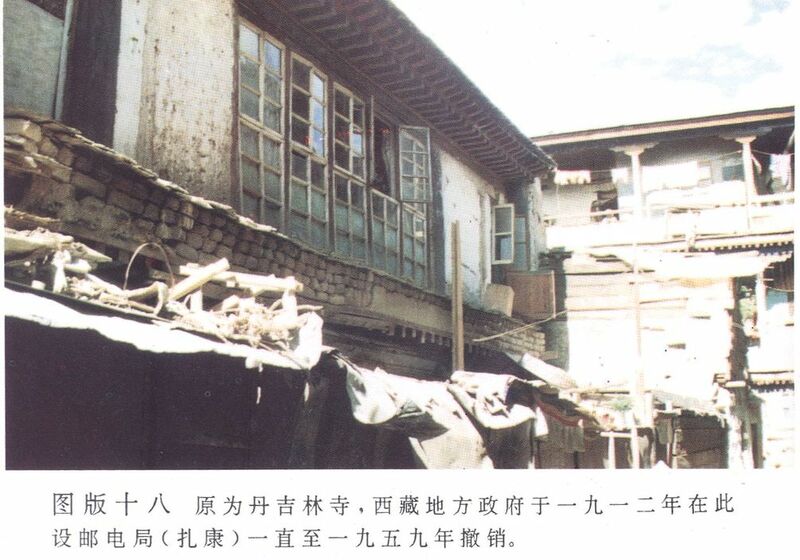 After 1959, the chinese converted this building into a housing one, for as many families as there were available rooms. No running water, no individual kitchen, etc etc... Incidentally, one of the rooms was home for Namdrol Lhamo's family (one of the "singing nuns", one of the youngest prisoner of opinion sentenced to repeated long term imprisonments, and finally released towards 2004 and escaped to India). Well, these are the photographs, a decaying building going progressivly to ruins. However, in the 80ties, with the financial, material, and manual help of a foreign NGO (and a symbolical one from the chinese, i.e. the paper authorization to do so ! )this building was renovated and rehabilitated, still to be, of course, a housing one, but very more convenient and secure. - Best.